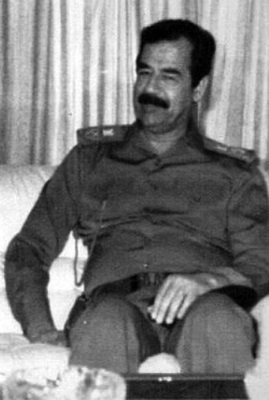 In 1980, Iraqi dictator, Saddam Hussein invaded neighbouring Iran. He believed that he could win a quick decisive victory because of the turmoil caused by the recent Iranian revolution, and because he believed that many Iranian officers who had served under the Shah would not fight for Iran's new Islamic regime. As with so many of Saddam Hussein's decisions, the invasion of Iran turned out to be a disasterous miscalculation. The Iranian people rallied around their regime, and offer stout resistance to the Iraqi advance. The war dragged on until 1988 with tremendous loss of life and at huge cost to both nations. And, when a ceasefire was eventually agreed between Iraq and Iran, Iraq found itself in saddled with enormous financial debts incurred as a result of the huge sums spent on the war. In 1989, Iraq requested that Kuwait forgive its debts, however the Kuwaitis refused. Additionally, Iraq try to increase its income by getting OPEC to agree to increase the price of oil by cutting production, however Kuwait and the United Arab Emirates frustrated this plan by increasing their own petroleum production. Iraq also claimed, baselessly according to the Kuwaiti government, that Kuwait was stealing Iraq's oil by slant-drilling into the Iraqi part of the shared Rumaila Oil Field, and demanded compensation for this. Realizing that Iraq could solve its economic problems by seizing control of the lucrative Kuwaiti economy, and misinterpreting somewhat ambiguous statements from the American ambassador April Glaspie as giving a green-light to military action, Saddam Hussein ordered his forces to invade Kuwait. In the early hours of August 2nd 1990, Iraqi forces crossed the border and drove towards Kuwait City. The Kuwaiti military did not have its forces on alert and was caught by surprise. In any case, despite offering spirited resistance, Kuwait's small military was quickly overwhelmed. Some surviving Kuwaiti forces were able to flee to Saudi Arabia and Kuwait. Following the invasion, the United Nations and Arab League quickly passed resolutions demanding Iraqi withdrawal, and placing economic sanctions on Iraq. Additionally, fearing that Iraq would now invade Saudi Arabia, American military forces, began to arrive in the region, with the objective of preventing any such attack (Operation Desert Shield). Iraq responded by announcing its complete annexation of Kuwait, holding Western hostages as "human shields" (although these hostages were later released), and offering to withdraw only if various other conflicts and disagreements around the Middle East were also resolved. In addition to US forces, a Coalition of 33 other countries was assembled to oppose Iraq. The United Kingdom made the largest contribution of any European nation, which included around 43,000 troops, and forces from the British Army, Royal Air Force (RAF), Royal Navy, and Royal Fleet Auxiliary. Over the next few months, a series of UN resolutions were passed by the Security Council. The most crucial of these, was Resolution 678 which was passed on November 29th 1990, setting a deadline of January 15th 1991 for Iraqi withdrawal, and authorized the Coalition to use "all necessary means" (i.e. force) to achieve Iraqi withdrawal. On January 17th 1991, the Coalition began to launch air attacks on Iraq and Iraqi forces in Kuwait. Over the next six weeks, bombing greatly reduced Iraq's military capabilities. As a result of the success of the air campaign, as well as because of superior training, tactics and equipment, the Coalition was able to drive the much vaunted Iraqi army out of Kuwait in a ground-war lasting just 100 hours.